Over the last few years, as well as posting helpful guides on my own site Music Industry How To, I’ve also posted a few on the Music Think Tank website. In fact, a good few of my guides have got to the front page of MTT and Hypebot. While I’ve shared a few of these with you in the past (all of which went down very well), I know not all of you have seen them. So today, I’ve decided to share with you my 6 top performing guides on the Music Think Tank blog. I’ve ranked these guides based on how many Facebook shares they have at the time of writing this. I didn’t include Music Think Tank Twitter shares, as Music Think Tank doesn’t currently display how many shares they’ve received on other social sites. We’ll start with the ones with the lowest Facebook shares first (well, the lowest out of the best 6), then build our way up to the most popular. Be sure to have a look at each guide for all the info. This is a post I created in early 2013, but which is still just as relevant to success as it ever was! In it I give 8 of the things you need to do to in order to give your music career the best chance of succeeding. With these 8 steps you can start to create your own music business plan. Even if you’re not new to the music business, you should have a look at this guide and use it as a checklist. If you find you’re not doing any of the things mentioned, you should get them done asap. Making it in the music industry is a complex game. There are many skills you need to pick up as an independent musician, but some are more important than others. The one I mention in this guide: probably one of the most important music business skills you can pick up! This guide is all about leveraging other people and media outlets that have a lot more influence than you. We all know you can’t make it in the music industry without links, yet many people go for the wrong links or don’t use the right ones effectively. This guide should give you an idea of what you should be doing instead. There are some musicians who after 10 or more years will still be making and trying to get their music out there on a wider scale. Without much luck. On the other hand, there are others who will be making a full time living after two or three years. There’s no wonder why some make it faster than others; they often have certain traits and a certain mentality in common. Having the knowledge of what to do combined with the 4 traits mentioned in this Music Think Tank article will give you a MUCH better chance of succeeding in your music career. So don’t wait until you’re 10 or 15 years into your music career before you realize you need to make a change, have a look at the above and get your music career moving today! So those are the first few most popular Music Think Tank business plans and guides I’ve written. Below are the top 3 most shared articles! Remember, popularity is based on Facebook likes rather than of Twitter shares, so when they’re taken into account, the order might change. This guide will show you 4 key factors on how to increase your chances of making it in music. Give it a look. The questions of how to promote your music has always been a hot topic. So much so, that this post alone has built up 223 Facebook likes and shares and is getting more every day! Now before you roll your eyes and think I’m going to tell you to “create a Facebook account and promote through social media” or to “get your music in as many places as possible,” listen up. This guide is going to be full of actionable content and advice that won’t be found in every post on the subject that simply rehashes information the writer has heard and not tried out themselves. It’s a guide I’m particularly proud of, so I hope you find it super useful. This guide looks at 7 truths related to the subject. 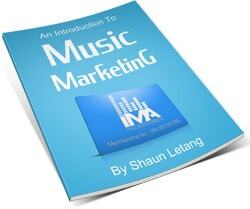 If you haven’t already, you need to have a read of this guide and get your music marketing knowledge up! If you want additional help with your music career, the above guides will definitely give you that. All of the above are proven to have gone down well, so hopefully they’ll help you as well. This is only a VERY small section of the guides I’ve written though. If you want help with all other areas of the music business, you should get access to over 200 guides I’ve written on various aspects. Knowledge is power, and being able to refer to these guides whenever you get stuck is very powerful stuff.